Will these flower-topped receptacles prove effective in the city’s fight against public urination? Paris has a pee problem. As any visitor with a nose knows, the City of Light is also a city of unpleasant, urinous odors. Every day, Parisian sanitation workers wash some 1,800 square miles of sidewalk in an attempt to combat the smell and curb infrastructure-damaging effects of public urination. But the city may have found its savior: the Uritrottoir. The name of this modern, flower-topped trough roughly translates to “pavement urinal,” and Parisian officials hope it will be the answer to their pee-containment prayers. Created by industrial designer Laurent Lebot of the French product studio Faltazi, the contraption is essentially a pair of stacked boxes. The top, red box has a planter and a sort of wide chute into the lower metal box, which is full of odor-fighting dry straw and, if the Uritrottoir is used successfully, pee from public urinators. A smaller Uritrottoir can contain 300 expulsions, while a large one can hold roughly 600. When full, an internet-connected sensor alerts a “urine attendant” to swap out the lower compartment, bringing its contents outside of the city for composting. 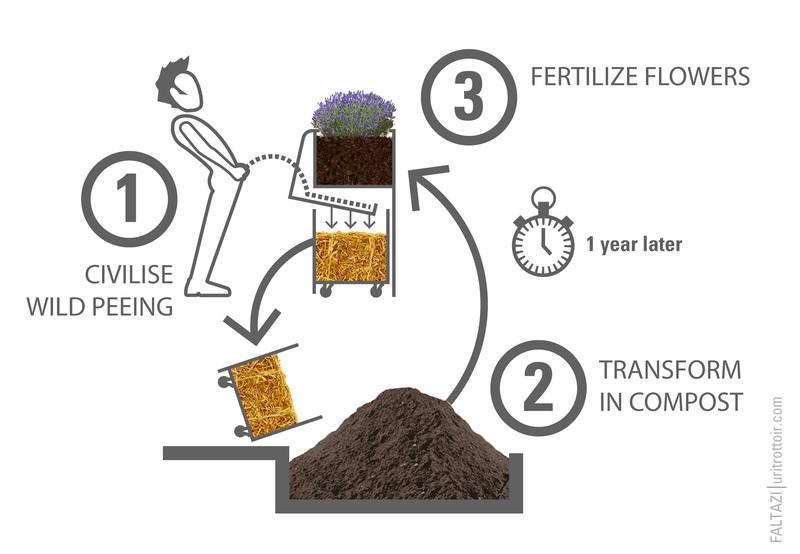 The resulting compost can then be used as fertilizer for public gardens, parks, or perhaps the flowers growing in the planter at the top of the contraption. Paris is currently testing two of these urinals, purchased for about $9,730 altogether, outside of the Gare de Lyon train station. If successful, they’ll buy more.